Police have had a busy week. Senior Community Constable Harley North updated the Gold FM Police File. 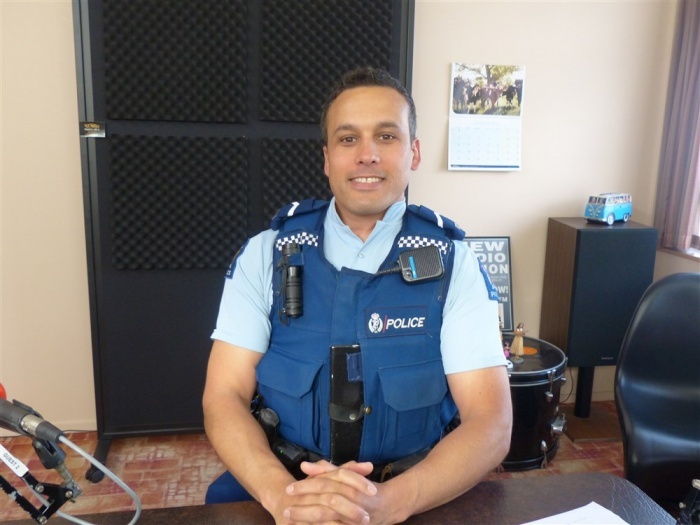 Stolen plants, a hit and run, Crate Day chaos, fights at Waihi Beach, motor vehicle incidents, a major landslide, burglaries, cannabis and more features in the Gold FM Police File. Overnight a Rifle Range Road address was burgled. 40-50 plants were stolen. Over the last month, police have received multiple reports of plant thefts around town. Police are seeking information from the community. A male pedestrian was struck by an unidentified motor vehicle at Tauranga Road near Heath Road. The vehicle did not stop. The pedestrian sustained injuries consisting of a suspected broken wrist and fractured ribs. Police are seeking witnesses or anyone with information. A new house purchaser contacted police after discovering a hidden room within the shed of his Tauranga Road property. The concealed room was found behind a wall and shelving units which had been fabricated to conceal it behind a hidden door. Police examined the room and made enquiries with the previous owner confirming that it was an old Cannabis grow room and not something more sinister. Police stopped a 64 year old Waihi male driving at Kenny Street. He was known to be a disqualified driver after a recent serious traffic conviction. His vehicle was impounded for 28 days. He will be appearing in Court charged with driving whilst disqualified. A Mackay Street residential property was burgled overnight. A shed and vehicle were entered and various property items were stolen including a meat from the freezer, tools, a Navman GPS and sunglasses. The shed and vehicle were left unsecured. A 28 year old Waihi male was arrested and charged for trespass after returning to New World Waihi having been previously warned to stay away from their premises. ‘Crate Day’ chaos unfolded in the area over the weekend: A police unit on patrol at Waihi Beach discovered a nylon string stretched across Seaforth Road at head height posing an extreme risk to road users particularly motorcyclists and cyclists. Luckily the patrol vehicle collided with it first and police dismantled it. A 21 year old Katikati male was arrested for disorderly behaviour at Waihi Beach Hotel for threatening behaviour toward others including bar staff. He also punched a window smashing it. The male was heavily intoxicated. Whilst being removed from the premises his 20 year old associate tried to intervene and was also arrested. Police received reports of about 20-40 people fighting in the car park of Waihi Beach Hotel after an earlier altercation inside. Multiple fights broke out in the car park. The bar was closed early as a result. Police will be investigating further. Police attended a significant landslide which blocked SH2 Karangahake and coordinated road contracting services to clear the highway. The slip caused significant delays and issues relating to traffic control and diversions. Eventually, one lane was able to be re-opened. Whilst police were dealing with the landslide another violent disorder incident occurred at Snell Crescent, Waihi Beach after a traffic crash involving two vehicles. A ute and hatchback car collided at an intersection causing the ute to flip on to its side. Two occupants from the ute were hospitalised with moderate injuries. Police are still investigating but early reports are that two groups began fighting after the crash. Further to this a Waihi Beach volunteer firefighter was assaulted by a male. The male suspect has been identified however at the time of this report police are still trying to locate him. The driver of the hatchback car underwent alcohol breath testing procedures and returned a result of 565 micrograms of alcohol. He is charged with careless driving causing injury and driving with excess breath alcohol. He will be appearing in Court soon. A vehicle parked at a Mackay Street property was unlawfully entered overnight. Fishing gear and a 20L petrol container were stolen. Police are investigating. A garage at a Gladstone Road property was burgled overnight. Entry was gained by forcing a window. A television and stereo equipment was stolen. Police are investigating. A male and a female youth were warned for possession of Cannabis after they were discovered loitering around Donnelly Street in the middle of the night. When a police unit stopped to speak to them evidence of recent Cannabis consumption was detected and they were subsequently searched. A minor amount of Cannabis was found in their possession. If you haven’t already noticed Christmas and New Year are fast approaching and hopefully, you get time to take a break and spend some relaxation time with family and friends. The holiday period is also known as ‘The Silly Season’ for good reason because of the alcohol-fuelled stupidity that goes on this time of year. After reading this weeks police report you could be forgiven for thinking the season has already started! A reminder that if you’re heading out for a night on the town and intend to drink alcohol, ‘Plan B4 U Party’ and make arrangements for alternative transport - Do Not Drive. Remember to drink responsibly, eat food and drink plenty of water to offset the negative effects of alcohol. Look after your mates and be considerate to others. Police will have extra staff in the area over the busy period and will be monitoring the situation closely.